The tube dress is a flattering style that can be custom made to fit the wearer without a pattern. This charming dress is perfect for the summer weather, as it features a gathered top. A sewing machine will make the stitching quickly on this uncomplicated dress, which could be made from a wide choice of fabrics including cotton, linen or silk. The dress is a perfect first project for novices to the art of machine sewing. Measure around the dress wearer’s body at the widest point, add 3 inches and divide the total in half. Measure from the bottom of the neck to the dress length desired and add 6 inches. Cut two pieces of fabric to the measurements for the dress back and front. Measure from the dress length bottom to the bottom of the wearer’s underarm and mark the fabric edges at the underarm with pins. Pin the back and front dress pieces together, right sides facing each other. Sew straight seams 1/4-inch from the piece edges from the bottom hem to the underarm markings. Zigzag stitch the edges of the front and back sections of the dress from the underarms to the neckline. Turn the back and front dress neckline edges under 2 inches to the wrong sides. Sew straight seams to create the cording tunnels on the front and back of the dress. Turn the dress to the right side. 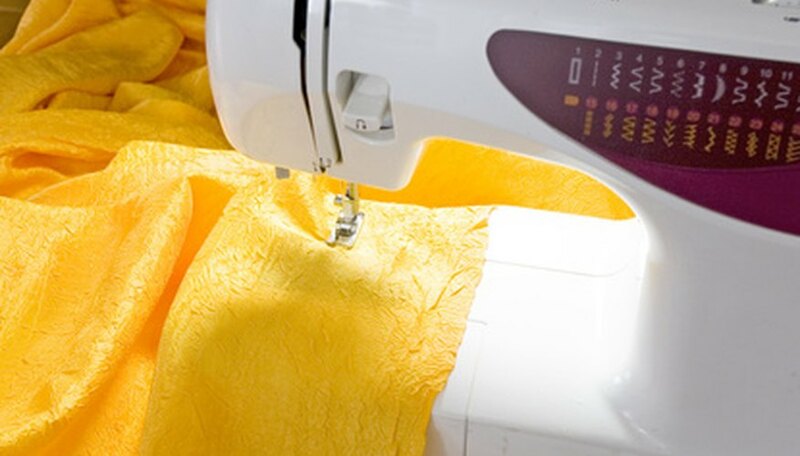 Fold the hem of the dress under 1-inch twice to the wrong side and hand-sew with small stitches. Cut the cording in half to create two pieces of cording. Thread each cord through the neckline tunnels. Tie the cords in a bow to each other at the top of the wearer’s shoulder.